Could their be a more aptly named plant than 'Silver Mound'? 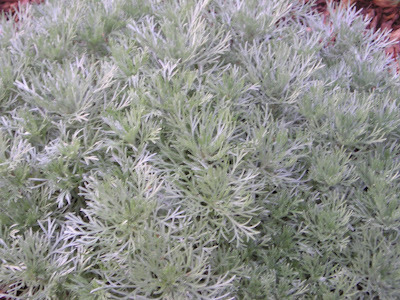 Artemisia schmidtiana has several common names like wormwood, mugwort, sagebrush, or just silver mound (which to me is the most descriptive.) This mounding perennial has soft silvery gray foliage that invites the casual observer reach down to touch it. It's hard to walk by without petting the 'Silver Mound'. It's drought tolerant which is a highly prized feature in many perennial plants. The puffy little plant is grown for its foliage but can spread through seed created by its small yellow flowers. It likes gardens in zones 3 through 7 and will grow to around 15 inches wide by 8-10 inches tall. My 'Silver mound's have exploded with growth since I planted them 6 weeks ago. 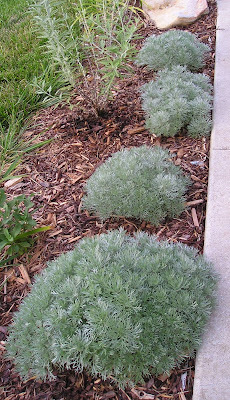 I planted my artemisia as a border-groundcover in our front sidewalk garden. I planted Russian Sage, Salvia nemorosa, and 'Stella D' Oro' daylilies along with the 'Silver Mound'. There is an 'Oranges and Lemons' gaillardia as well as another salvia that I believe is a Salvia lyrata with purple foliage in the sidewalk garden. Silver mound is also fairly easy to propagate through stem cuttings during the summer. Just take a 3 inch stem tip cutting and stick it in sand after applying rooting hormone. 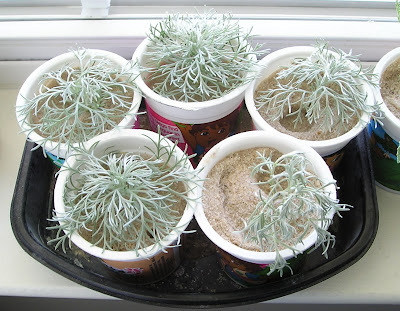 I have seven more started with plans to take additional 'Silver Mound' artemisia cuttings later in the summer.